So we've been seeing a lot of defender builds and lot of creativity with skill combo. However the only two builds that I find useful in PvE is the Quick slash and Counter attack builds. You may wonder what's quick slash and counter attack build? Here's an explanation on how they work. Quick slash: A skill build that relies on fast attacks, no unnecessary skills to put your character in delay of skill animation and knows how to cancel attack animation. Quick slash needs cyclone strike to gain the attack speed and of course you might want to have some basic skills such as Rush, Stunning Smash and the other strikes (Piercing and Chaotic) to perform quick skill attacks. 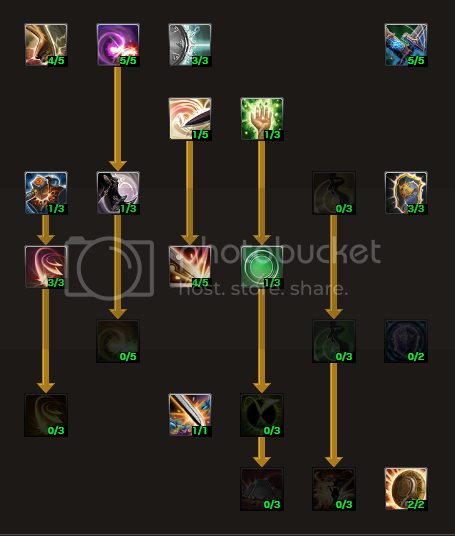 What about the other skill builds or skills in defender? Well i'm not going to say they are bad or good, however this game relies on heavy/fast dps to beat monsters as you are not a "tank" in this game. However you have the choice of being the "tank" if you want to run first and gather all the mobs to clear them out with AoE skills/spells. But that doesn't require any defensive active skills except for the passives that grants you 100% block without taking damage because you won't be needing the damage reduce etc. Threatening is just the usage of slowing mobs as it debuff the enemy which is 2 skill in one and you might aswell want it to trick enemy that you are buffing yourself as it is the same animation as the other two shouts. A good example on not needing any defensive active skills can be shown on this video if you and your party members can handle the large mobs. Well the best diamond is the Greater Emerald of Strength and Agility (Crit) But I would say Strength and Vitality for the extra health. Otherwise just stick with Emerald of Strength for the +7 as they will release more content and more gear/diamonds/emeralds will be updated. For diamond I would say Diamond of Living Water (torso), Diamond of Vitality (Shield) and for weapon go with whatever you want. With my build I would try the Skill that adds the ice wind effect, sorry I haven't played for a while and being rusty with item names.